Chicago is one of the many places we’ve enjoyed sharing yoga programs for the past several years. As Frank Sinatra sang, “it’s my kind of town”. We especially like Millennium Park and an amazing mirrored sculpture that is lovingly nicknamed “The Bean” due to its kidney shape. The artist, Sir Anish Kapoor, named it “Cloud Gate” since approximately 80% of the structure reflects and bends the Chicago sky back down to the viewer. Yes, heaven on earth. My kind of town. This icon is made up of 168 polished stainless steel plates that are welded together, as if magically with no visible seams. The bean attracts lots of visitors on a daily basis. Almost everyone takes a selfie here. Some people even take photos of their own reflection in the bean’s mirror. the young woman in church who meticulously studies the effects of changing her facial expressions in the reverse camera feature of her cell phone. At least until she sees me seeing her. Then, sheepishly, she stops. We both smile. perhaps you’ve even marveled at the eyes that look back at you in the bathroom mirror, pondering the consequences of light on the pupils as you open your eyes as wide as you can and then close them? Our physical being is a sensation and a science. 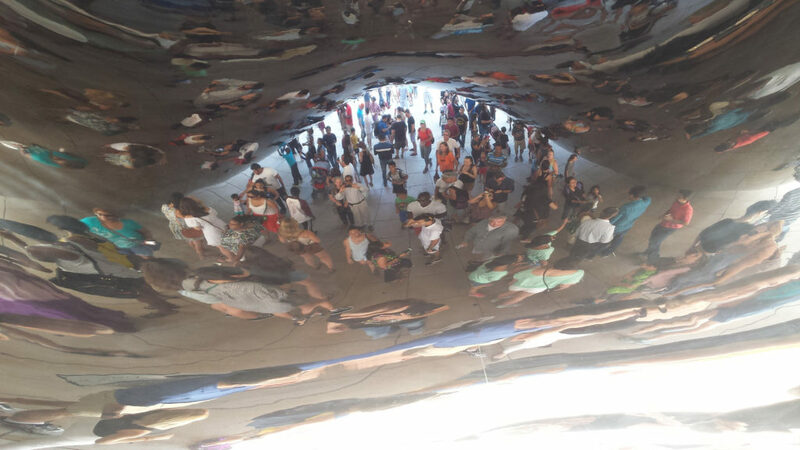 Back to the bean: you can traverse the 66-foot mirrored circumference of the bean. It’s big enough to get you out of your head and small enough to wrap your mind around. You can even walk right into and under the 12-foot high, arched inner fold, also mirrored. This inner chamber creates a variety of optical illusions in the reflection of your body’s size, shape and perceived distance! Perhaps we are more, or less, than we think we are? Perhaps there are many facets to our being? So the deeper question is: who am I, really. Me… but on the inside. In the chamber. What is this experience? I think the selfie phenomenon is, in some way, a reflection of our fascination with the human miracle and on a deeper level, the longing to seek the “who am I” question. And, to me, standing amongst the selfie masses and city skyline, the bean sculpture also reflects us as one big human ‘bean’ family. The bean attracts us at the ‘me’ level. Look! There I am. That’s me! Look at me from this angle. Now see how much taller I look now, or skinnier, etc. Then, we notice all the other people and we think about the ‘we’ of things. We might even lose ourselves in the reflected swarm of bodies if it is a really crowded day. Some people seem anxious about this…where am I? I have to find myself. Some seemed to relish the blissful sense of being a part of this colorful shape-shifting living art. It’s a new snapshot… each moment, just like life. There’s a beautiful stillness deep within the continual movement of the comings and goings of the fellow travelers. You could stand still while others moved, or move while others pondered. It’s a delicious moment-to-moment creation of life and art. Being and mindfulness do not need to be quiet. Expanded awareness (experience of “thee”) fills the bean and overflows. Yoga is everywhere. The inner landscape of our collective, colorful beauty reflects back to us, all of us. And it continues in this way, whether we notice it or not. Have you been to the bean? Feel free to share your insights and photos. The day we were there was quite hot. I wonder what it’s like in Chicago winter? Thank you for that reflection Terry, it was beautiful and insightful! I like what you said about the age of selfies. Although many people get caught up in the superficial or materialistic idea of the selfie, maybe there is something deeper occurring. A sense of the self that is eager to be discovered. This is the first time in documented history with such advanced technology, and perhaps such advanced distraction? Funny to think that all yogis before us lived in a world without technology, without constant connection to work, loved ones, and google. Yet still we ask, “who I am”, and “why am I here”. The new website is wonderful, and I really enjoy the addition of the blog:) sending you love and light!